I love horror movies! And so when I heard that there’s a new Thai horror movie in town, I was excited! I have a friend who is a big horror movie fan like me, so I quickly called her up and see if she would join me for this movie. As luck would have it, she was free so we booked the tickets. What the heck, even if she’s not free, I know she will make herself free! Now before I go any further, I would like to mention that both me and my friend are die-hard horror movie fans, meaning, if the movie ain’t scary, we ain’t gonna enjoy it! Our standards are so high that of all horror movies shown in the past ten years, only a handful made it into our list of horror movies worth watching! When I talk about horror movies, I’m not talking about those movies about a mindless slasher who kills during Halloween, or some killer who knew what the hell you did last summer. Nope. My definition of horror movie is movie about ghosts, ghouls, vampires, possession or about the supernatural and the paranormal, if you like. 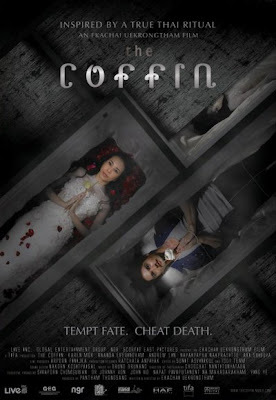 The movie we went to watch is called “The Coffin” directed by Ekachai Uekrongtham who also directed “The Beautiful Boxer” and the amazingly successful “Chang and Eng” musical which was staged in Istana Budaya a few years back. By the way did you see this musical? It remains one of my top favourite musicals to this day. You can read the review at Kakiseni website. I had high expectation for this movie after watching the trailer. The fact that it opened at No.1 at the Thai box office also made me very eager to watch it. What I find interesting is that this movie is actually inspired by a controversial but real Thai ritual organised by at a temple in northeast Thailand where close to 10,000 people turned up to lie in coffins in the belief that this could take away their bad luck and prolong their lives. This event was even recorded in the Guiness Book Of Records! Very briefly, the movie is about two central characters. One is Chris (played by Ananda Everingham), a claustrophobic architect who decides to go through the ritual to save his fiancee, Mariko who is in a coma. The other is Sue (played by Karen Mok), a nutritionist from Hong Kong who goes through the same ritual to save herself from brain tumour one week before her wedding. After the ritual, both of them experience miracles. Chris’ fiancee Mariko wakes up from her coma, and Sue’s cancer amazingly disappears. But as expected, strange and terrifying things start to happen. If you have not seen the movie yet, please do not read further as spoilers abound. You may however, watch the trailer below. I like the opening where the girl in the coffin explains about the ritual. And the scene where we see hundreds of coffins arranged in a circle around a gigantic Buddha must surely be the most impressive and memorable scene. A really great opening to what is to come. Unfortunately, and I’m really sad to say, the movie goes downhill from there. I mean, there were some scary moments, but the story unfolded too slowly for me, and I kept hoping for some unexpected surprises but there were none. In fact, I could figure out the whole story halfway through the movie. The only surprise I got from this movie was that most of the dialogues were in English! I did not expect that. So I guess there is no need for any remake by Hollywood, unless they want to feature different actors and actresses. During the movie, I could hear a girl behind me kept saying “Oh my god, oh my god” and was clearly terrified. There were also some guys who screamed at some shocking scenes, and then laughed it off. And I was like, oh come on, do they need to react like that? It was not that scary, at least not to me and my friend. We looked at each other and just smiled at the audiences’ reactions. I guess as far as horror movies are concerned, we were both pretty hard to please. Despite that, I won’t say the movie is bad. It’s quite entertaining, but certainly not in the same level as movies like “The Eye” and “Shutter” which incidentally also starred Ananda in the lead actor role. I can tell you, after watching “The Eye”, I was terrified for a few days after, but “The Coffin” did not give me the same effect. I guess the saving grace is the actors themselves. Both Ananda Everingham and Karen Mok gave very good performances, especially Karen Mok. She brought out her character’s vulnerability very well and I love it! I also like the way director Ekachai filmed some of the scenes and I would say the creepy atmosphere was excellent in the movie. I also like that scene where Karen Mok’s character Sue learns in the hospital that her cancer is gone and then they showed the window where we could see flashes of lightning to indicate a storm coming up, as if to prepare us for some scary moments. Brilliant! This movie has a moral story behind it. It is based on the belief that we cannot change what is meant to be. Because there’s this thing called karma. When Sue recovers from her cancer after the ritual, she changes what is meant to be, but as a result her boyfriend dies instead. But what I find unfair is when Sue tries to reverse this later by undergoing the reversal ritual. 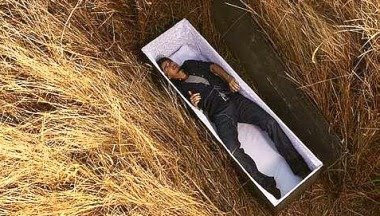 She got her cancer back, but her boyfriend remains dead! Now, how can that be? Did her boyfriend just die for nothing? And it’s not even his fault! Well, I guess you can’t make a dead person come back alive, can you, unless you did what Stephen King did with his characters in Pet Sematary. Compare that with “The Eye” , my all time favourite horror movie. I am not a fan of horror movies....:) Have a great weekend! khengsiong, yes it's a Thai movie but surprisingly 90% of dialogues in English! Maybe aiming for international market including USA. Thanks for the review, Foong. Now I don't have to watch it. No, I'm not a fan of horror movies. I heard "The Eye" was good, more like scary good. When I was in Thailand a few years ago, I was introduced to it. I didn't dare to perform this ritual. monica, yay, high five!! : ) Go watch it though it's not that scary! I mean if you are a horror movie fan, you won't find it very scary. My husband loves to watch horror movies. Here in the USA, we have a cable On-Demand channel called FearNet with all scary movies, he watches this channel all the time. Like you, I don't like gory movies, I prefer ones that deal with the supernatural, ghosts, etc. some horror movies scared the hell out of me. Thai horror are quite scary lorrr. Usually, I find that men do not like to watch horror movies. I don't know why most of my friends who love ghost stories are females. Maybe the men are scared to watch such movies and I think they won't want to admit they are scared! So I guess your husband and I are exceptions. Haha! pete, yes I think Thai horror movies are better than Japanese or Koreans.I hate to watch ghost stories that do not have a proper storyline. Most Korean horror movies are like that. I believe the current trend is Thai horror movies. Going to watch it since you rate it high. faisal admar, you didn't read my post properly. I did not rate it highly. It wasn't scary to me. I only rated it 5/10 for scariness. Yes, The Exorcist is my favourite horror movie of all time! "If you have not seen the movie yet, please do not read further as spoilers abound. You may however, watch the trailer below." i'm never a fan of horror movies because I'm scared. I would cover my eyes with pillows until the scary scene is over! haha... but this movie sounds interesting enough for me to hold my pillows again. tekkaus, I could not agree more with you! I hoped they had put in better substance and increase the scare factor, then this movie could have turned out to be pretty good! Lots of potential to be big, this movie. They just missed the mark! I Love horror movie too. But a bit scare when watching alone at the night. Huhu..